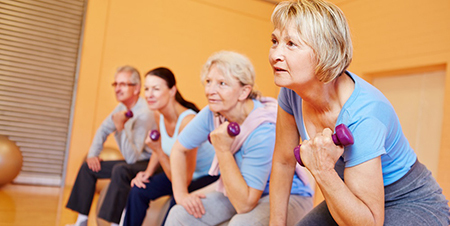 Strengthening, stretching, balance and aerobic exercise will keep you active , mobile and feeling great! “People do what they enjoy or what feels most effective, so some aspects of exercise and fitness are ignored “ says Rachel Wilson a physical therapist at Harvard-affiliated Brigham and Women’s Hospital . In reality we should all be doing aerobics, stretching, strengthening and balance exercises. Aim for 150 minutes per week of moderate intensity exercise. “If you are too winded to walk up a flight of stairs , that is a good indicator that you need more aerobic exercise to help condition your heart and lungs , and get enough blood to your muscles to help them work efficiently “ says Wilson. Aerobic exercise also helps relax blood vessel walls , lower blood pressure , burn body fat, lower blood sugar levels reduce inflammation , boost mood and raise ‘good’ HDL cholesterol . In the long term it reduces your risk of heart disease, stroke, Type 2 diabetes, breast and colon cancer , depression and falls. As we age we lose muscle mass . Strength training brings it back . “ Regular strength training will help you feel more confident and capable of daily tasks like carrying groceries, gardening, and lifting heavier objects round the house. Strength training will also help you stand up from a chair, get up from the floor and go up stairs. “ says Wilson . Strengthening your muscles makes you stronger but also stimulates bone growth, lowers blood sugar, improves balance and posture and reduces pain in lower back and joints. A good strength training programme will include squats, push-ups, lunges and resistance exercises. “ Remember, it is important to feel some muscle fatigue at the end of the exercise to make sure you are working or training the muscle group effectively “ Wilson says. Stretching maintains flexibility. Aging leads to loss of flexibility . Muscles shorten and don’t function properly. That increases the risk of muscle cramps and pain, muscle damage , strains, joint pain and falling and makes daily activities more difficult. Aim for a program of stretching every day at least 3 or 4 times a week. 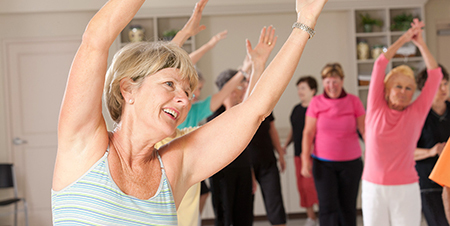 Warm up your muscles first with some dynamic stretches – repetitive motion such as marching or arm circles. Then perform static stretches – holding a position for 60 seconds for the calves, hamstrings, hip flexors, quadriceps and muscles of shoulder, neck and lower back . “ However don’t push a stretch into the painful range . That tightens the muscle and is counter-productive “ says Wilson. 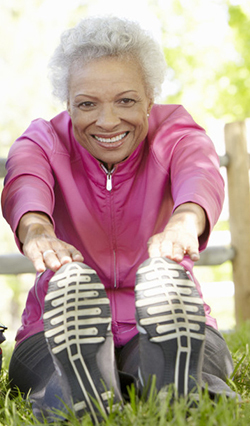 Improving your balance makes you steadier on your feet and helps prevent falls. As we get older the systems that help maintain balance – vision, our inner ear, and leg muscles and joints – start to break down. Training your balance can help reverse these losses. 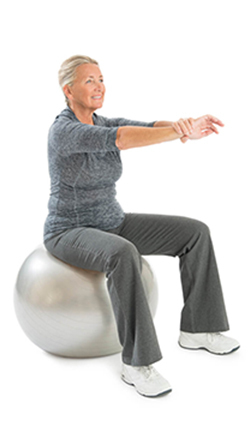 A physical therapist can advise you on the correct exercises. Typical balance exercises include standing on one foot , walking heel to toe, with your eyes open or closed. To focus on joint flexibility you can practise walking on uneven surfaces and strengthening leg muscles with squats and leg lifts. Get the proper training before attempting these exercises at home or do them under supervised conditions.